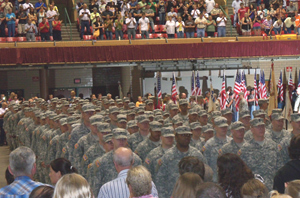 Soldiers line up for send off ceremony. The Iowa National Guard held the last of over two-dozen send off ceremonies today in Des Moines for the Iowa soldiers who’ll deploy to Afghanistan in November. Iowan Sydney Lett sang the song “Count the Stars” that she wrote in tribute as part of the send off at Veterans Auditorium for the 334th Brigade Support Team that will be part of the 2,800 Iowa soldiers and others from Nebraska that will head overseas. National Guard commander, General Tim Orr spoke directly to the soldiers. “I thank each and every one of you for your sacrifice, your service, and your dedication to our state, our nation and our children. Your commitment is phenomenal,” Orr said. Orr thanked Iowans for their support at all the send-off ceremonies. Staff Sergeant Dustin Gryp of Victor described his feelings after the ceremony. “Excited and ready to go,” Gryp said. He says the send off also made him feel proud. Gryp says the big turnout showed a lot of support and shows that everyone cares and that means a lot to the troops. Gryp held his baby daughter as his two other young children looked on. He says they don’t fully understand that he’ll be gone for a year. He says his son understands a little bit, his oldest daughter is not sure and the baby is too young to understand. Gryp says they may understand he’s leaving, but not the full scale of it. The soldiers will first head to Mississippi and then California for final training before going to Afghanistan later this year.